Osama Bin Laden is wanted in the world's most sought-after snapper. 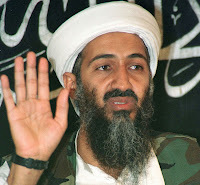 More than 8 years, since the events of 9 September 2001, Osama had not known of his existence. The leader of Al Qaeda has always failed arrested by United States military. Various means are adopted, with no small cost, and even sacrificed their lives. The U.S. government itself is very eager to capture Osama Bin Laden is alive. But the plan itself doubted by U.S. Attorney General Eric Holder who estimates that Bin Laden would be caught dead in a state. and finally he could be caught as well, although the situation is dead, and many in the news by everyone. and there is also something funny at the time of death of Osama. The U.S. military never runs out of mind to continue to seek ways capture the leadership of the international terrorist network. A lot of crazy ways suggested by some people to catch the brains behind the collapse of the twin towers of this. The Week in today outlined five proposals. In 2005, scientists at the research center Edwards air base, trying to make a teleportation technology like in Star Trek. This technology plan to bring U.S. troops crossed the line a wide area. How crazy is allowing the soldiers to move through a teleport into the cave hideout of Bin Laden and immediately arrest him, saying, "let's go!" A man not known for sending a letter to the Pentagon as he proposed the plan makes no sense to capture Bin Laden. The man wrote, "Train a bear that has a GPS system for days. While equipped with a camera, let the beast is hunting down Bin Laden. " Indeed, the sense of smell bears are considered more powerful than a bloodhound. The Pentagon is reported to have trained bees to track the bomb. However, a small robot companies are reported to have found another way which they considered more effective. The company is claiming they can make a bomber-sized aircraft such as bees. Mini tool is claimed to hunt down and kill terrorists. According to the Daily Mail, the British Defense Ministry reported to have spent the funds of USD27 thousand or approximately Rp.245, 7 million just to recruit psychics to track down Osama Bin Laden's hideout in 2002. British MoD Party recruited 12 psychics to find out whether they can track the six senses is a terrorist. But British Defence Secretary seemed aware if the plan is not effective at all. Bin Laden is pretending to be animals .The researchers of geography at UCLA in 2009 and then claimed if it managed to find Osama Bin Laden's hideout using the sophisticated technology called "wild distribution technology." The technology used by wildlife, the presence of Osama can be tracked on the basis of the presence he was last time. UCLA said that if Bin Laden is known to be the last time in the village of Parachinar, Afghanistan. But no one has responded to the report.